Besides your everyday linens, you may be the owner of holiday-themed towels, table linens and seasonal bedding. 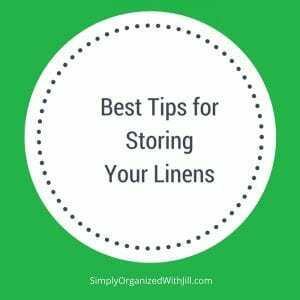 There are options, besides closets, for storing and organizing linens. Have you looked under your beds lately? There could be less important items under there that you’ve forgotten about and no longer want to own. If you decide to use this space, I think it’s a great area for your seasonal bed linens. First contain it all in a clear container, bag or space bag. I haven’t personally used space bags and have had mixed reviews from clients who do use them. These bags squish your linens into a solid brick after you’ve removed the air inside the bag with a vacuum. I’ve been told the seal may break with time. You decide if they are right for your needs. Storage chests, specifically the cedar-lined variety, are ideal for linens. If you are lucky enough to own one, I would choose to use it for seasonal bedding. You might even have a cedar closet like I did in my childhood home and in that case I’m jealous! I can remember how much I liked the cedar fragrance. Place holiday-themed linens into storage bins with their respective holiday décor items. Label the bins so you’re able to find them at a glance. Spare dresser drawers are also a nice spot for linens because they are accessible. Simply open a drawer and there they are! Before adding to your seasonal linen collection, stop and consider the amount of available space you have and want to devote to its storage. As you edit your linens, pass your extras to local charities and animal shelters.